I had the pleasure of speaking at the launch of a fine new book of essays on George Whitefield on the weekend. The volume arises from a conference held in Oxford at the tercentenary of Whitefield's birth, and is edited by Geordan Hammond and David Ceri Jones. The editors must have exhausted all of their good judgement on the construction of the volume, since they asked a theologian to launch a book of historical scholarship. I gleefully accepted my charge, and waxed rhapsodic about the lives of strange Christians. Here is a sample taken from the talk, for those who are interested. George Herbert describes the Christian life as a colour-stained window: itself “brittle crazy glass” that is brilliant only as it is illuminated by the sun. Such windowed lives release the divine colour into the world as they are transparent to God’s light. We have sometimes called such lives “saintly”. But our conception of “saintliness” sometimes gets in the way of our appreciation of the Christian past. Historical study has two cardinal sins: anachronism and hagiography. Anachronism is an aberration in historical methodology, but the problem with hagiography is entirely theological: the hagiographer doesn’t understand sainthood. The saints are not blandly impeccable. As G. K. Chesterton observes, a saint is simply someone who knows that they are a sinner. Perhaps there is something of this in Whitefield—though it's not always visible. 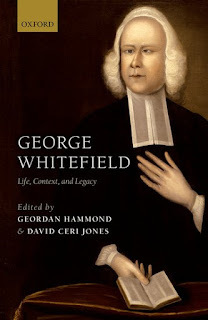 The editors note in their introduction that Whitefield drew “audacious comparisons between his own life and the life of Christ” as he published his own hagiographic autobiographical journals (in his twenties, no less!). It was only later in life that he removed some of the more purple-tinted passages from these journals. We won’t understand our saints by overlooking their faults, as this book makes plain. We have before us the many Whitefields. Here stands the superficial Whitefield: the dramatic and tearfully flamboyant preacher, afflicted with a “squint” since childhood, and endowed with a resonant voice. And beside him see the self-important Whitefield: convinced of divine calling, capable of discerning divine will, illusioned with notions of greatness, who at one time shared that he was predestined by divine fiat for the episcopacy. Behold here the evangelical Whitefield: with a certain formula for salvation, convinced of humanity’s great need of divine grace. Meet Whitefield the controversialist: picking fights with theatre groups, denouncing rationalists, and attempting to moderate John Wesley’s aversion to Calvinism. Know the travelling Whitefield: fostering the revivals in Ireland, Scotland, and Wales, and traversing North America and allowing his heart to settle in its towns, eventually releasing his soul there. And contemplate the difficult Whitefield: a failure at familial relations, terrible with friendships and women (once proposing by asking “Can you, when you have a husband, be as though you had none?”), finally unhappily married, and unreconciled with his Mother before her death. He was an uncomfortably ardent supporter of slavery, controlled by the belief that the institution of slavery must be refined rather than abolished by the Christian gospel. A hagiography could never be so interesting—and a life is never so simple as being merely an example of impeccable spiritual performance. Just like the saints, Whitefield’s life can only speak to us if it is a human life. How can we understand grace, if we have never allowed ourselves to see the gaps in nature? My favourite chapter is Emma Salgård Cunha’s piece on Whitefield’s use of literary technique to stimulate the affections. “Whitefield’s primary activity… was to preach”, she writes. He even wrote a sermon on how to listen to sermons—an idea that we should seriously consider filching. Whitefield saw some connection between the material mechanics of the sermon and divine grace. And yet, he was keenly aware of the distinction between genuinely graced affection, and human emotional manipulation—exploiting it crucially in one particular sermon by bringing his congregation to tears and back, only to show them how moved they are by human tragedy while yet remaining unmoved by Christ’s passion. Tears, you might know, are a common theme when discussing Whitefield. He is a man always on the verge of embarrassing himself by weeping. Tears, as Whitefield himself knew, are not always pious and admirable. They can be petty. Whitefield, in this volume, weeps both kinds of tears. This book is mostly historical, and we are told that the good historian will not insert themselves into the past, but that is not to say that the past won’t rush forward to meet us in the present. My discipline is sometimes called “systematic theology”, which sounds like an orderly and tidy discipline. But if my profession is marked by anything, it is an ardent disrespect for boundaries. The systematician doesn’t want to leave the past in the past, but wants to see it come alive in the present. I want to see all the great Christians of history standing before me: I want to see Ignatius before the lions, hear Origen reading scripture, observe Macrina instruct her brothers, hide behind the pear tree as Augustine sins, sit in the cells across the centuries with Evagrius and Symeon and John and Theresa contemplating the darkness, witness the storm with Luther, and live in the city with Calvin. And I want all of this so that I can learn what faith is, so that I can know how to pray. We look to our Christian forebears to see the cracks in our nature, and to find where grace fits. And we have to thank Geordan Hammond, David Ceri Jones, and all the contributors to this fine volume for lifting up the window of George Whitefield’s life, so that we can examine the brittle glass in the hope that the sun might strike it and shine through into our dark halls.